Some system informations from my Win2k box is directed to a 3½" front-panel with 19 LEDs by different means. 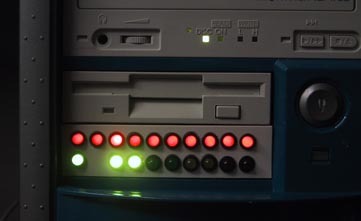 The ten red LEDs on the top are addressed by a 4017 decimal counter which gets it's impulses from the main-board's hard-disc activity signal output. In plain words: each time the regular HD-activity LED lights up, the next LED to the right is on. Directions are taken from Arne Rossius www.elektronik.de.vu [german]. 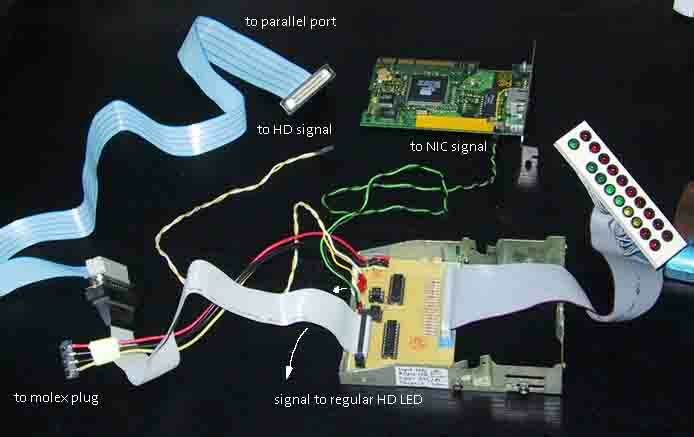 The single green led on the bottom left is the signal from the NIC activity-led. I found this nice 3-Com card on the junkyard. Good for me, because my cheap'o motherboard's onboard NIC does not even have any LEDs. The eight other LEDs can give back any system-information Windows is able to monitor. 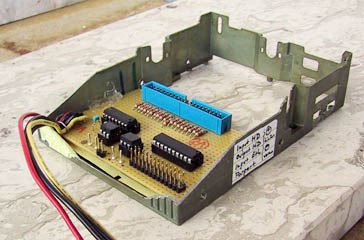 It is addressed by a LED-Meter software which sends its data over the eight data lines of the parallel-port. Build directions are also on the site of Ryan Myers: www.pointofnoreturn.org. There is a german translation available with the software repackaged, which helped me a lot. Thanks to you guys for guidance and ideas. I am not really an electronics wizard. The light for the network activity is unfortunalty only lighting up for a short time. The knight-rider effect of several red LEDs lighting up at the same time can actually only be seen on the longer exposed video. 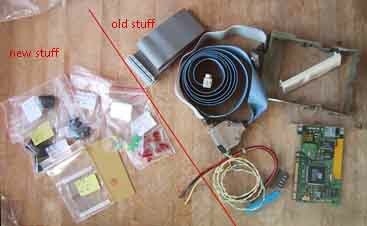 The used parts: as most people, I am fond of reusing scrap material. This is where everything is flowing together: the circuit is placed in a frame of an old HD. 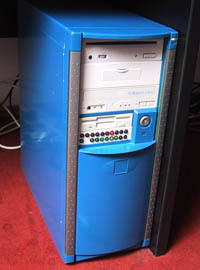 This beast used to carry eight platters and needed and still needs the height of one and a half modern HDs. Thanks goes to Manfred Wurzer for that. Some action shot - something between 10 and 20% CPU load, the NIC is TX/RX data and the HD is active - the exposure-time was long enough, that all ten LEDs on the top were active during the exposure. 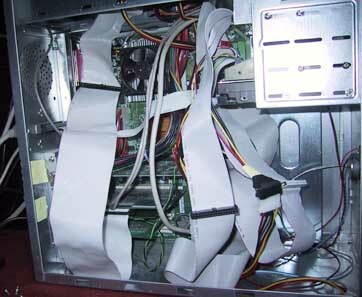 That was my last free front panel. ;-) Well, I can't think of anything else to put in the box. The air flow was not improved by this mod.